Haul road Improvement and dust control with combined water savings. DustChek is supplied to your mine site or road project in 2kg containers and is simply mixed in to your water-cart at the time of filling. Our consultants will come to your site and analyse your specific requirements based on site conditions and provide on-site technical support as required. 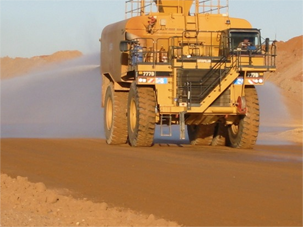 Water savings of up to 80% can be realised with the use of DustChek as well as improved traction in most materials prevalent in mining conditions. Cost-effective haul road maintenance is easily achievable with DustChek dust control from New Ground Projects Pty Ltd.
© All rights reserved. NGP ROADS. Websites Adelaide | South Australian agent for PolyCom Stabilising Aid and DustChek dust control.